The Resident Evil 2 Remake game contains a selection of special weapons, specifically designed to help you survive Racoon City. One particular weapon is the shotgun, a pump action, powerful weapon that deals massive damage to zombies. In this guide you'll find a complete walkthrough for obtaining this weapon. First off, let's be clear here - the W-870 shotgun is one of the early game weapons, not the best, but certainly one you want to have with you through the early chapters. It's a four round, 12-gauge pump action shotgun that provides high damage blasts. It's perfect for clearing out groups of zombies or fending off enemies in tight areas. In case you're wondering where the shotgun is, it's actually located inside the second area of Police Department (one of the early areas of the game). This area of the Police Department is a complete wreck, dimly light and slightly flooded. 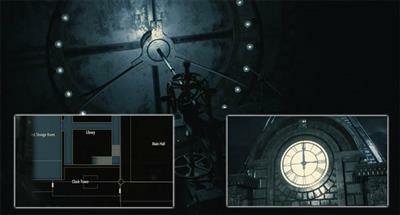 You'll need to navigate the tight corridors and search the building using only your flashlight. Thankfully, there aren't that many zombies in the building and some can be avoided entirely. 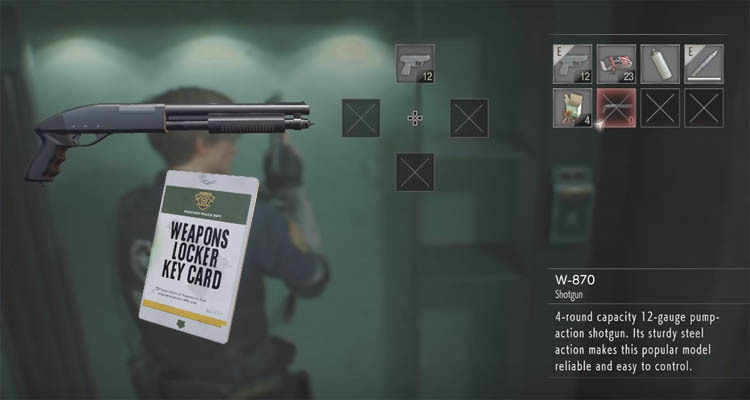 Before you get your hands on the shotgun you MUST obtain the keycard - which is a special key for accessing electronic terminals to unlock lockers and other inaccessible areas. First, let's make sure you're in the right area of the game to collect the shotgun. By now you should have rescued Marvin and have been given the Combat Knife. Having used the knife to cut through the tape you now have access to the second portion of the station. Make your way through the tight western corridors of the flooded Police Department and past the two dead police officers. Swing a right and through the red double doors and into the Operations Room. This room is shown on the map above in red. Once inside the Operations Room, take note of the keycard which is directly in front of you on the table. 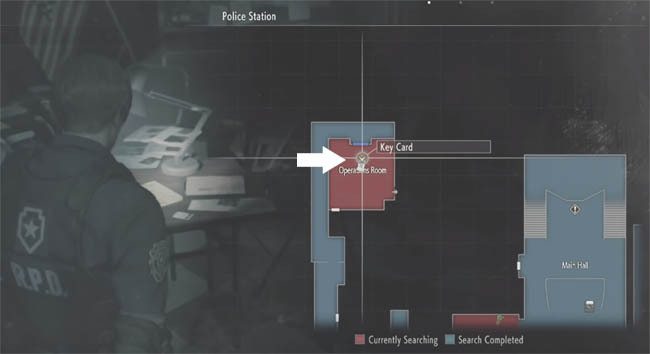 The white arrow points directly to where the keycard is located on the map above. Simply interact and keep the card into your inventory for a little later. From within the Operations Room, head to the far left hand corner of the room. Jump on top of the box with yellow tape around it. Climb up and through the small window to drop back down into the corridor again. Follow the corridor onwards, taking a left turn before the zombie who is shaking the machine. There are two doors here, one to your right and one to the left. We want to take the LEFT door which leads into the Safety Deposit Room. See the map above which shows the route you should have taken with a white arrow. Once inside the room, follow the narrow path towards the very back of the room. You should see a locked cabinet with the shotgun inside (see white arrow above). To open this locked cabinet you MUST use the keycard you picked up from the Operations Room. Simply interact with the panel to the right of the locker and select the keycard from your inventory. The locker will open and the shotgun and a handful of shotgun shells are yours to claim!! Be ready though because picking up the shotgun will trigger a zombie attack. Make use of your new weapon and give them hell! There are two additional lockers (106 and 109) in this room which contain shotgun ammo. It's certainly worth collecting this ammo for the long run. Opening these lockers is not as simple as entering your keycard. Instead, backtrack to the door where you entered the Safety Deposit Room and take note of the keycard panel. Interact with the panel and simply enter the numbers of the lockers you would like to unlock. In our case, enter digits 106 and then digits 109, to unlock the two lockers. Head down the corridor once again and collect the shotgun ammo from these newly opened lockers!